LFW helpful information: Amex Insiders are roaming fashion week and looking to help you! As you walk around Somerset House this weekend at London Fashion Week, there are little angels everywhere waiting to pick you up should your schedule prove to be too overwhelming. These angels are chicly dressed and they call themselves the Amex Insiders. In fact, this season they are more like fashion superheroes. At least that’s what we’re calling them as they are sporting uniquely designed capes from fashion mastermind Christopher Raeburn for the AW14 season. So how can these stylish individuals help you in your quest for discovering the latest and greatest in AW14 fashion? Well, let’s start with getting around fashion week. If you’ve forgotten your tickets at home (yes, I’ve done this before), you can check with the Amex Insiders to see where the shows are taking places and at what times. They’ll have all the info at the ready and they’re eager to assist. Now, you should also know that the Amex Insiders are not confined by the beautiful buildings of Somerset House. These lovelies can reach out and help you in securing dinner reservations, finding someone to mend that broken heel in a pinch or even organizing a dry cleaning run (you never know when red wine will strike). Bottom line – keep an eye out for the American Express crew in their beautiful Christopher Raeburn attire and use, maybe not abuse, them to the fullest! Oh, and for those of you not at fashion week, you can follow the insiders at home as they attend all the best shows by following #amexstyle. Oh, and one other thing. 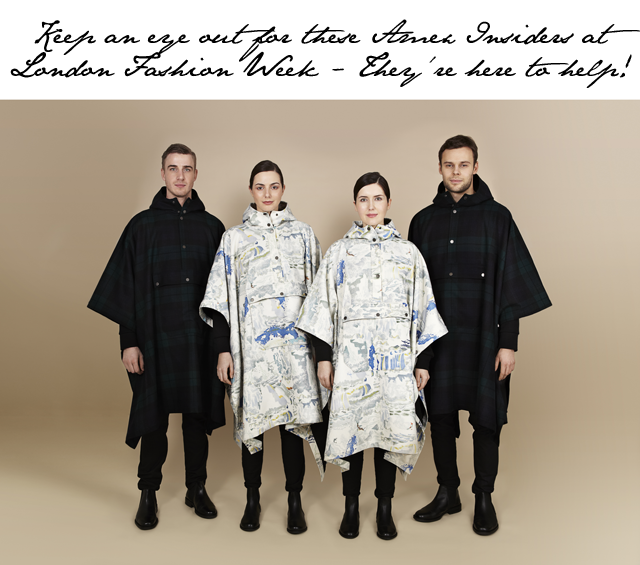 There's actually a competition happening on Twitter to win the Christopher Raeburn cape! All visitors to LFW need to do is share their favourite look on Twitter or Instagram with the hash tag #amexstyle. Yup, that's it. Share as many times as you want and the winner will be selected by an independent judge after LFW is officially finished. Note: FFG has been working with Amex to get their inside track on London Fashion Week.